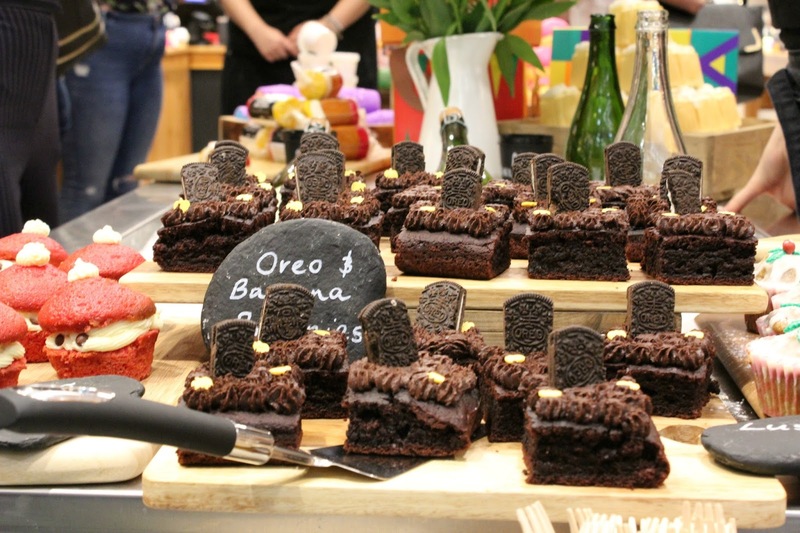 On Monday I headed down to Lush Plymouth for a magical, sweet smelling evening discovering the new Halloween & Christmas Lush products. I’d be lying if I said that I hadn’t already openly looked for spoilers a month before, I just love their seasonal products so much, and they have seriously outdone themselves this year! I was in need of a good pamper and a bit of relaxation after my swim the day before (more about that later this week! ), each blogger event always seems to top the last one, so we were all in for a wonderfully festive evening! We were greeted by the most insane selection of perfectly appropriate themed cakes made by V is for Veggies, you can catch her delicious bakes at the Royal William Food Market, Plymouth on the first Sunday of each month. 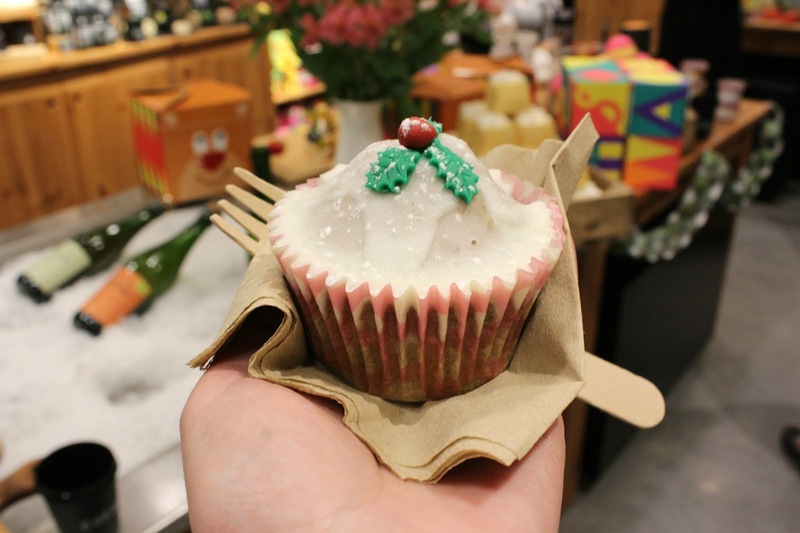 Everyone was won over by the peeping Santa, Lush bubble bar inspired cupcakes! Did I mention that all her bakes are completely Vegan too? They’re not only yummy, but guilt free too. Once we’d taken at least 100 + pictures of the cakes, it was time to meet the new Halloween editions to the Lush bathing family. With this years seasonal collection, we’re sure of a bewitching bath time. I was disappointed with the Halloween collection last year as there was only a few products, but they have totally outdone themselves this year, and I love everything! First up was Autumn leaf bath bomb which really is the perfect bath time treat for this time of the year which beautifully signifies the autumnal leaves and the gorgeous colours we see during this season. Sparkly pumpkin bubble bar is back this year which has been one of my favourites for the last 3 years, it’s super glittery and achieves the bubbliest, wicked orange coloured bath. Also joining sparkly pumpkin this year is Pumpkin bath bomb which is perfect for those who don’t like to emerge from the bath covered in glitter! Awww! Can we just take a moment to appreciate how cute little Boo is? This ghoulish guy is a bath melt, and I can’t wait to use this one in my bath closer to Halloween. Everyone loves a little bit of Halloween shimmer, right? This is a new type of product to the Lush collection and is a solid shimmer bar which leaves hydrating sparkles behind on your body whilst keeping your skin soft and supple. You could probably tell if you looked close enough which bath bomb this is! Monster’s ball creepy little eye is the last thing to fizz when you use this bath bomb, he reminds me of the character in Monsters Inc, but can’t for the life of me remember the name! After a peek at all of the wonderful Halloween products, it was time for some Reindeer throwing hoops game, which anyone can play if you pick up the Reindeer box Christmas gift set! Smelling the new Halloween collection was exhausting work, so it was time for a little break with this Christmas pudding inspired cupcake, SO good! If you thought the Halloween collection was good, wait until you see the new additions to the Christmas range! I absolutely love the red slippers bubble bar, when it comes to the Christmas bath products I don’t like using them too early in the season, so I’m super glad the red slippers bubble bar is one that could really be used all year round, it’s super sparkly too! The bubble wands get better each year, I love this dragon Santa hat wearing bubble bar! Never Mind The Ballistics is a bath bomb come bubble bar, it reminds me of refreshers sweets and smells amazing, it looks pretty good when it starts fizzing too..
Mistletoe bath bomb is such a beautiful bath bomb, it’s jasmine scented and creates the most gorgeous pastel, bright coloured lush art. Elf on the shelf fun is just the cutest!! 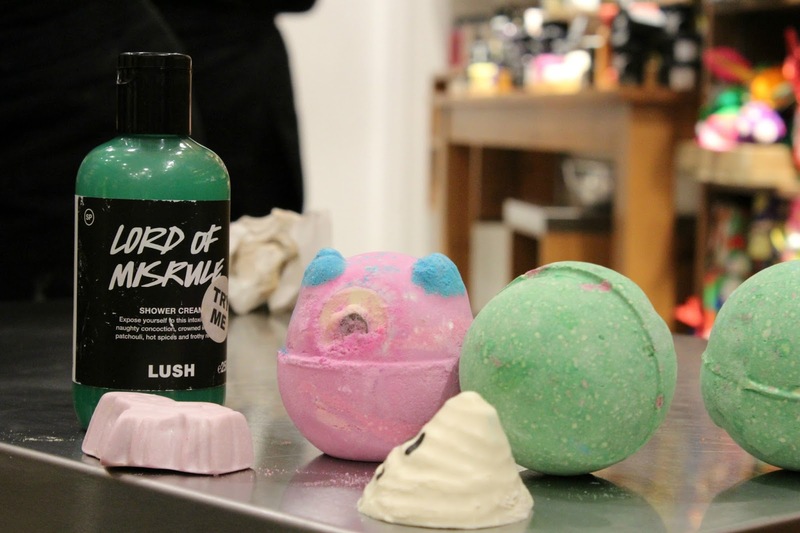 Their Fun products make such cool gifts, I got some for my birthday last year, and although I can’t say my creations were as good, it did make bath time a little bit more fun whilst I was soaking in a bubble bath of some kind. Fun can be used for shower gel and for a bubble bath too, it’s a 3 in 1 type product! Snowie was created to remember the legend that is David Bowie, it will help make you feel like a star too after using this. Thumbs up to whoever helped to create this cute, sweet smelling bubble bar. Jester bubble bar wand is part of their Christmas range too, but could definitely be used all year round. I love how these come with their own little jingly bell like the other Christmas wands. Not forgetting the old favourites that are returning for another year, I’m so happy to see some of my favourites returning, but I’m also sad that Cinders bath bomb won’t be, as that was one of my favourites from last years collection. Despite being an avid lush bath bomber and bath melter, how did I not know that So White existed before? This bath bomb is so simplistic on the exterior, but packs a punch when it starts fizzing, it has an apple aroma and it fizzes and foams whilst creating a blanket of bubbles, I think I need 10. Although Cinders won’t be returning, the magic of Christmas wand bubble bar is, and it’s the same sort of scent so that’s okay. It really does capture the true scent of Christmas, with spices and almond and all things nice. It’s the perfect one for a cold winters night. Shoot for the stars bath bomb is beautiful on the inside and out, once it’s fizzed you’ll find 6 cocoa butter stars that are perfect for smoothing over your skin for a shimmer and some nourishment. Once we’d covered all of the beautiful bathing products, it was time to look at the shower selection of goodies. All you snow fairy fans will be extremely happy as it is back again, with 1kg bottles and a snow fairy body conditioner has also launched this year! But don’t worry if you’re team twilight like me, because although the shower gel can only be purchased from Lush Oxford Street, this year they have released a Sleepy hand and body lotion and Mr Sandman dusting powder which is basically TWILIGHT! I have already stocked up and been sniffing it profusely as it’s just so good, and boy have I missed being able to shower with Twilight. Santa’s belly is a bit of fun! I’ve never mastered showering with a shower jelly, but they make the best gifts for kids and adults. Also need! I forget how cute butterbear is and I really, really need this gift set. It’s proved to be a popular seller so it’s worth getting one now before they sell out. I love these cute cloth wrapped gifts, they’re one of the most inexpensive lush gifts and even when the bubble baths have been and gone you have these cute cloths to keep afterwards. As always, the packaging and colours used throughout the gift sets is amazing. Extreme attention to detail has been made in every gift. I thought I’d finish with a Snow Fairy picture for y’all, as I think most people are team snow fairy, right?! We left with some amazing Christmas and Halloween products to get stuck into which have joined the lovely collection I got for my Birthday – I’m posting a Lush haul next week so keep an eye out for that! What do you think of the new seasonal collections? Have you tried any of the new products yet?